As long as I can remember, I’ve always had a bike. But until very recently, I would never have imagined owning anything like my latest acquisition… a Brompton. Either riding or being given a ride! 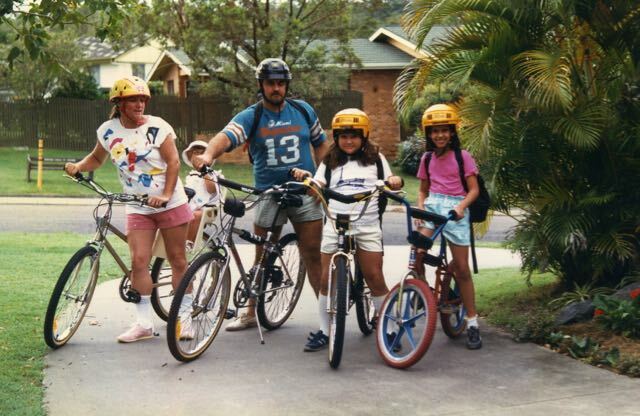 We rode a lot as kids – either just around our front yards with the kids next door, or on family rides from Mt Gravatt (a suburb on Brisbane’s south side where we lived) to Stones Corner and back, or through Toohey’s Forest, or sometimes over to Annerley to meet Dad riding home from work, and once or twice into the city – that was always a big ride. Things were made a bit easier when the bike path along the South East Freeway was put in, but going home was always harder than coasting away downhill, whatever our destination. Living on hill also meant there was a good chance you’d find yourself getting off and pushing your bike up the last 20m or so – until we grew bigger and had bikes with gears, anyway. When I moved out of home to a place closer to the city, I naturally took my bike with me. Still near enough to bike paths, I could now explore along the Brisbane River up to St Lucia a lot easier than before. The Eleanor Schonell Bridge for busses, pedestrians and cyclists, connecting Dutton Park on the south bank to the University of Queensland at St Lucia on the north bank, is very convenient compared to the ferry service it replaced (as fond as I was of the ferry). Don’t get me wrong; these weren’t everyday or every weekend rides. I’m not what you’d call a fitness junkie. But I do enjoy riding a bike. 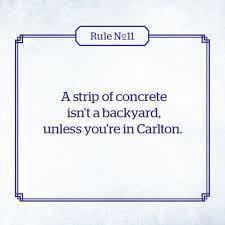 Having said that, it was left behind when I moved to Melbourne. It didn’t fit in my suitcase along with my other essentials. My intention was to bring it down eventually – it was a great bike… but that never happened. It boiled down to 3 S’s – space, security and safety. Where would we put it? When your house is 5m wide, and with no front or back yard to speak of, you don’t have much room to play with. A lot of people chain their bikes to their front fence. I don’t know how secure that is, and I didn’t want it to be in the weather. As for personal safety…a bit of green paint (indicating a bicycle lane) on the road means nothing to some drivers. Nor does a ‘Stop’ sign, sometimes. As a result of being somewhat deficient in the peddle department, we’ve pretty much stuck to bushwalking, although a couple of times we’ve hired bikes while on holiday. The George in Christchurch (New Zealand) has complimentary mountain bikes for hotel guests, and even a year after the 2011 earthquakes it was an interesting city to ride around. We were more prepared when we went to Canberra over Easter 2012 – we took our own helmets with us. Being able to drive there from Melbourne also helped – fewer limits on luggage weight and size! But renting a bike is just not as good as having your own. On our travels Stephen’s often mentioned that there are some great Rail Trails around Victoria that he’d like to do ‘one day’. Starting from one town and staying a night somewhere else, sampling local produce at a good hotel in a regional town… As you may know, we have a Mini (Cooper S). So while the idea was certainly appealing, we didn’t have a practical way to put the idea into practice. The lightbulb moment came one day when Stephen was engaged in a rather frequent activity for him – waiting patiently for me. 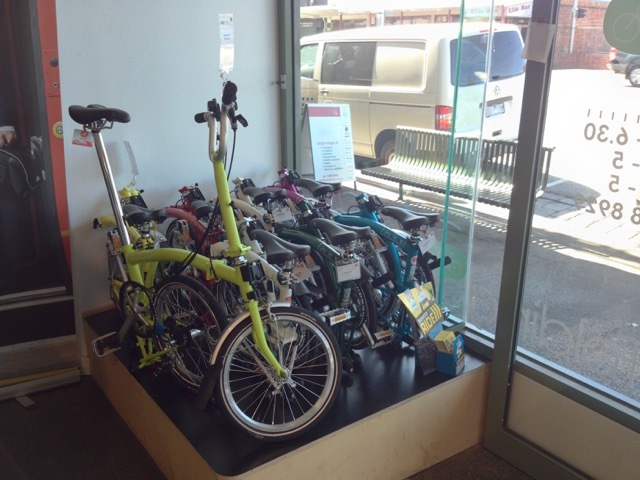 He saw a Brompton folding bike in the window of a bike shop and was struck by how small it could fold up. Admittedly, Stephen was looking in the window of a dedicated electric and folding bike shop, but Velo also have a second shop packed with other cycles of all descriptions at the end of the block. As is his wont, Stephen researched this new thing he’d found. And found it was good. Soon I was hearing about how good they were too, and our Saturday morning walks up to the local shopping strip inevitably included a brief stop outside Velo to look at the Bromptons in the window. But I still wasn’t 100% convinced. How could something with wheels that small be efficient? Or comfortable? Ok, so James May thinks they’re the bees-knees (read more in an interview here). Whoopi. But you don’t buy a Brompton with loose change found down the back of the sofa. They’re hand-made in London (watch this), not mass produced somewhere in Asia. After at least a year of talking Stephen must have known the time was right. Either that or he was just getting impatient. “What if I buy you one so you can ride along with me when I go for a run,” was his opening offer. It was tempting and I tried to resist (not all that hard) by playing the Fiscal Conservative card. It didn’t end up working, and by that afternoon I was the proud owner of a red Brompton. 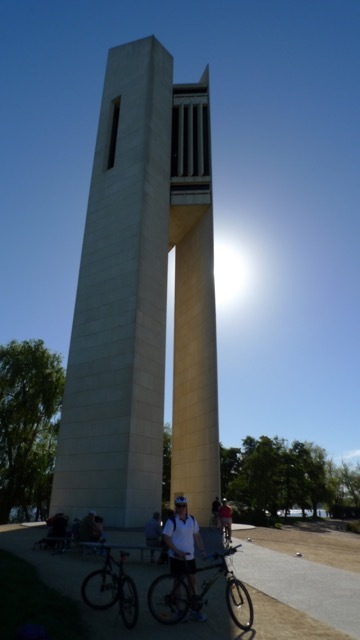 Riding around Princes Park is the only way I can keep up with Stephen! In the end the only real questions were 1) how high do you need your handlebars and 2) how many gears? My red Brompton is a H3L which translates as having a long front stem, three speeds, and guards over the wheels. Check out Brompton’s Bike Builder for heaps more options – or visit your local folding bike shop to get a good idea of the differences between the options. Compared to the 18-speed mountain bike I used to ride, my first impression was that the front wheel felt like it was right beneath me (it’s not quite, but they do have a great turning circle). Look away and it’s easy to forget that you’re not on a ‘big bike’. The crank shaft is the usual length and the gears are fantastic. Even when I had 18 gears to choose from I can’t honestly say I would normally have used more than 3-4 anyway – the highest, lowest, and one or two in between. But, possibly the feature I love most about my Brompton is that it feels so light to handle, which makes it a pleasure to ride. 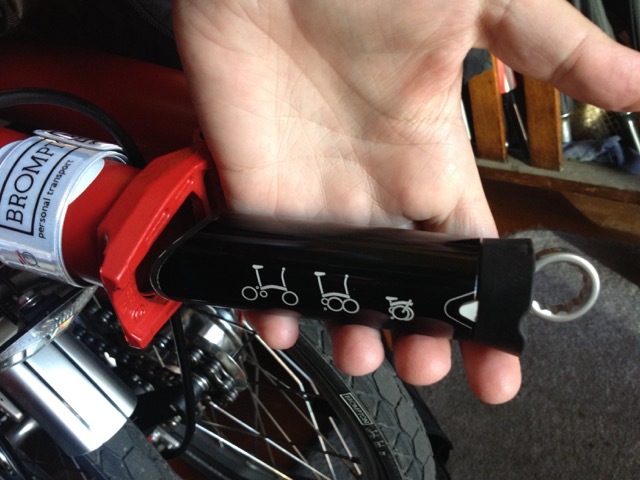 Steps four and five – fold down handle bars and release seat. Just have to adjust pedals now and my Brompton’s as neat as can be! Naturally we couldn’t leave without picking up a couple of accessories, like this really awesome tool kit that fits inside the frame of the bike! How cool is that?! I also love the way the front bag (there are plenty of designs to chose from) clips on and releases so neatly, and is fixed to the frame – which means a heavy bag won’t effect your steering. Brilliant design! 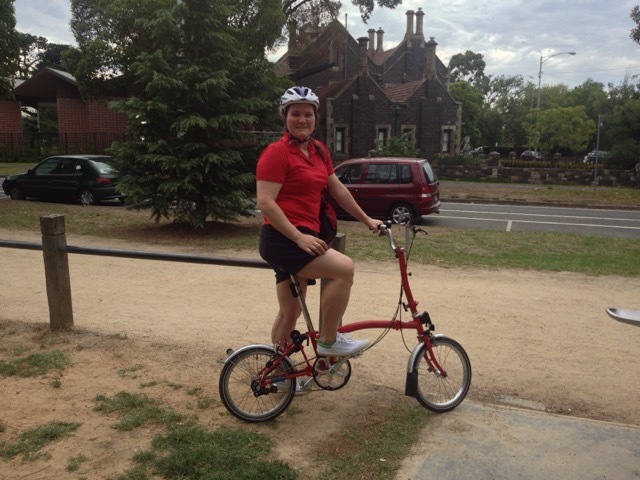 I may not ride it to work (many other Brompton riders do), but my little red bike has already ventured beyond Melbourne to Ballarat and been ridden around Lake Wendouree while Stephen’s run a few laps. Stephen’s also tested its practicality and found it to be the fastest and easiest way to meet up with people around Melbourne during the week. With the cover on, how many people would realise this is a bike? Once my red Brompton has the company of a Turkish Green Brompton (due to arrive sometime in May) we can start to enjoy even more cycling adventures. Stay tuned! Categories: Brompton (Folding Bicycle) | Tags: bicycle, bike, Brompton, folding bicycle, folding bike | Permalink.